So Nolan is a month old now, and I’m still not getting in the kitchen much. Between pumping and feeding and changing diapers and the like, it’s hard enough finding time to brush my teeth, much less plan and cook a meal. So we’ve been keeping it simple: Freezer meals, quick-cooking stuff from Costco, donations from visitors and take-out runs by hubby have been pretty standard for the past few weeks, but I’ve squeezed in a few items, and if I can sit down long enough sans-baby to write up some posts, I’ll fill you in. For now, I’ll point you in another direction. Last February, I decided to make masaman curry for Jeremy’s birthday. My pantry, however, is decidedly of the Italian bent, and I wasn’t about to go buy everything I’d need to toast and grind and smash in order to make fresh curry paste, since I don’t actually like curry. Jeremy loves it—particularly the masaman—and has been trying to get me eating curry for years, but it’s just too spicy for my palate (both in the ay-caliente sense and the volume-of-spices sense). What I did instead, as you can read in the original post, was purchase a packet of premade masaman curry sauce from Curry Simple. Couldn’t be easier—you just stir-fry all the meat and veggies you like, pour the sauce over everything until it is warmed through, and serve it with rice. I got a large packet, reasoning that curry freezes well and Jeremy could eat to his heart’s content and then save the remains for later meals. However, it actually turned out to be the only curry I have ever met and liked: well-balanced, slightly sweet, and not spicy at all. 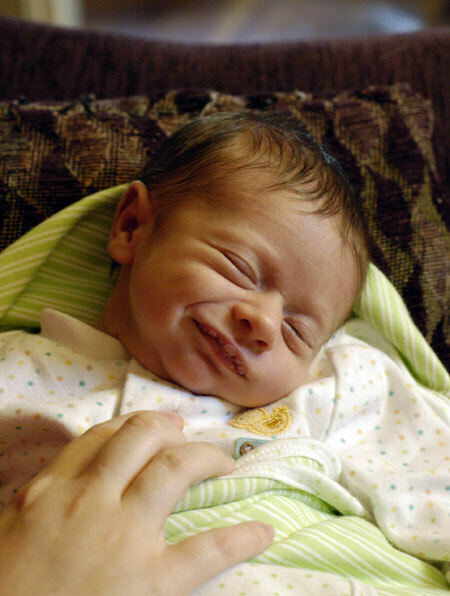 After Nolan was born, I was racking my brain for easy meals, and that curry sprang to mind. Soon several more packets of sauce were winging their way to our doorstep, and we ate masaman curry for several meals this past week. I make mine with just slices of chicken breast, boiled red potatoes, and roughly diced onions, and it only takes as long to make as the rice takes to cook. It just keeps growing on me: it’s only been a few days, and I’ve already found myself wanting to bust open another package (which sort of amazes me, I must say). And as an extra bonus for new moms, according to my wonderful doula, the spices in curries are also beneficial to lactation! Update 4/27/08: Last night’s dinner was yellow curry, from the small packet we received as part of a current promotion. I used shrimp, onions and green peppers in it; we thought it was tasty and it was mild enough for me to eat without drinking gallons of water, but I think the masaman curry is still our favorite. 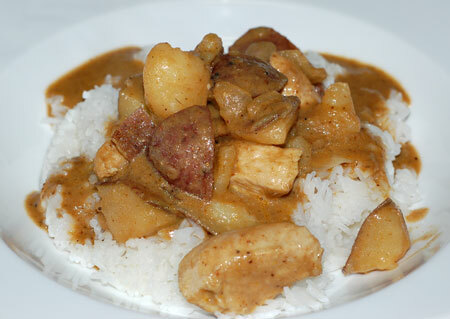 Update 5/3/08: More masaman curry with chicken and potatoes for dinner last night. I think we may be getting addicted! We’ve already gone through the order we placed after Nolan’s birth, so I ordered even more this morning: More masaman, of course, but Jeremy talked me into trying the red and green curries also, even though they are spicier. Update 8/14/08: Last night’s dinner was yellow curry with chicken, potatoes, onions and bell pepper. I ate mine way too fast because the baby was fussing, and burnt my tongue pretty thoroughly, but what I could taste of it was very good. 🙂 I want to try making the yellow curry with some leftover tilapia we have in the freezer, but Jeremy is anti-tilapia due to associating it with his kidney stones a couple weeks back. My name is Shannon and I’m the editorial assistant at Foodbuzz.com. Following up on a recent email invitation to be a part of our newly launched Foodbuzz Featured Publisher program, I just want to reiterate that the Foodbuzz team loves reading your posts and would be very excited to have you become a part of our blogging community. I would love to send you more details about the program, so if you are interested, please email me at Shannon@foodbuzz.com.